Obama Aides Considered A Clinton-For-Biden Switch, Book Says : The Two-Way After focus groups and polls indicated that replacing the vice president with Hillary Clinton wouldn't boost the president's re-election effort, the idea was dropped. Former White House Chief of Staff William Daley says the campaign was simply doing "due diligence." 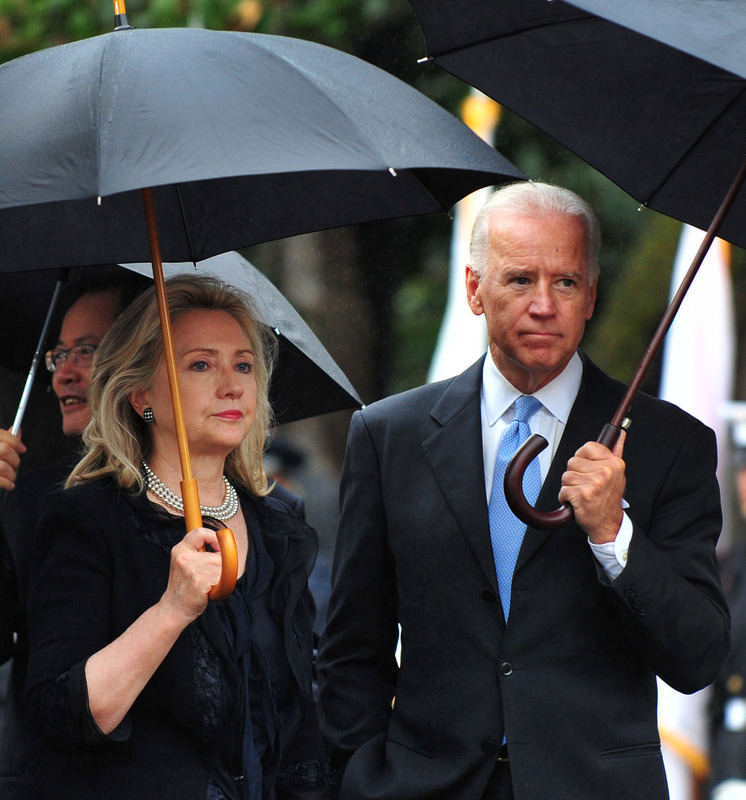 Then-Secretary of State Hillary Clinton and Vice President Biden at a White House event in October 2011. A new book says President Obama's aides were then studying whether to replace Biden with the former first lady on the 2012 ticket. "President Obama's top aides secretly considered replacing Vice President Joseph R. Biden Jr. with Hillary Rodham Clinton on the 2012 ticket, undertaking extensive focus-group sessions and polling in late 2011 when Mr. Obama's re-election outlook appeared uncertain," The New York Times reports. The Times gets that news from an advance copy of Double Down: Game Change 2012, a book due next week from political journalists Mark Halperin and John Heilemann. The newspaper says it obtained a copy "from people in the publishing industry." Rumblings about a possible Clinton-for-Biden veep switch were heard in late 2011. As It's All Politics wrote that year, Bob Woodward of The Washington Post had been saying "it's on the table." Obviously, it never happened. According to the Times, Halperin and Heilemann report Obama's aides "concluded that despite Mrs. Clinton's popularity, the move would not offer a significant enough political boost to Mr. Obama to justify such a radical move." Clinton was Obama's secretary of state through the president's first term. The former first lady and Biden are now among those who may make bids for the 2016 Democratic presidential nomination. William Daley, who was White House chief of staff in 2011, tells the Times that it was simply "due diligence" to study a possible switch. The Wall Street Journal, which says it also has seen a copy of the book, adds that Daley said in an interview that "he didn't know if Mr. Obama weighed in on the matter and [that he] never discussed it with the president." Update at 9:10 a.m. ET. Switch Never Considered, Key Aide Says. "Never any — any — consideration of VP/HRC switch. Not even entertained by the only person who mattered."